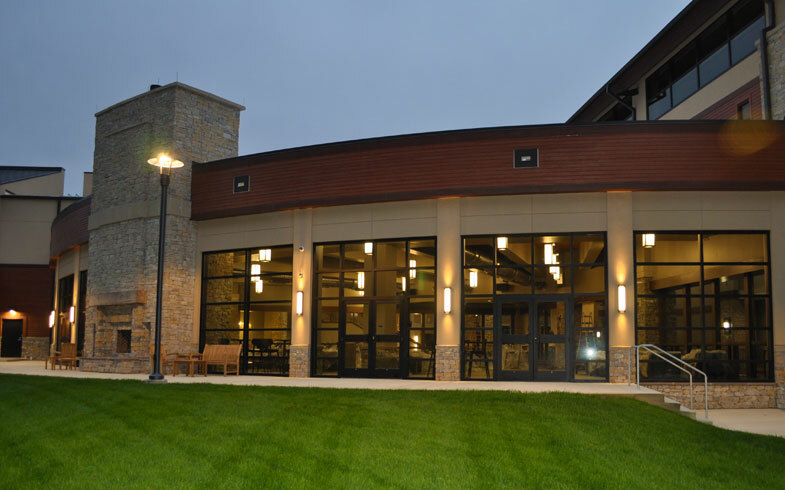 The community at Cornerstone Chapel has held its services in the same building in Leesburg, Va., for nearly 20 years—and has grown considerably since then. The church decided to expand through a project called Making Him Known so that members could bring their friends and neighbors. Central to this project was the renovation of a 110,000 square-foot building, with a worship hall that seats approximately 2,500 people. Lighting is an important element of the project, as it will provide ambiance to those who attend services and guide them to the building and also make the services easier to see for those who watch via video and livestreaming. Highlights of the firm’s work are evident in the open ceiling of the main worship hall, which required a precise layout of nearly 100 lights and an exposed install of all conduit. Above this modern-looking gathering space with auditorium seating, the team installed 26,000 feet of conduit. In other parts of the building, lights gleam down from exposed wood ceilings, with no visible wiring supply. To produce this effect, the team installed a rough-in above the wood and below the roof membrane. The main entrance corridor is approximately 40 feet tall with floor-to-ceiling glass. The electric supplying the south end of the building had to be run underground almost a year ahead of time and coordinated so that all the conduits across that area would be invisible. The JE Richards team also worked with the building owners to ensure the work allowed enough empty conduit space underground to fit the building’s future needs. In the atrium are streamlined hanging lights and fixtures on the tall stone columns that support high ceilings. To light the lofty columns, the JE Richards team members completed their work on an elevated scaffold platform. The natural-looking columns and exterior walls of brick-shaped stone presented another challenge, as this uneven surface requires custom work to install each light. JE Richards coordinated with multiple trades to not only install functional lighting, but also achieve the look that the architect and building owners had in mind. The work on this aesthetically pleasing building was done in record time, with the JE Richards team. At one point, the team installed 75,000 feet of wire—more than 14 miles—in just seven weeks. The team’s members were proud to contribute to Cornerstone Chapel, which ultimately will light up both the community’s worship services and its outreach to others.